Recognizing that this was going to be the most hotly contested and anticipated midterms in recent memory, broadcast and cable news outlets put a ton of resources into their coverage, seemingly treating it as though it were a presidential election. The English language broadcast networks even expanded their coverage for this year’s midterms to include the entire prime time daypart (8 – 11 p.m. ET), a move traditionally reserved for the cable news nets. Broadcast networks covered the 2014 Midterms for a single hour in prime time (10 p.m. ET). All of that hard work paid off from a ratings standpoint. According to Nielsen, a total of 36.1 million people watched prime time coverage of the midterms across 11 Nielsen-measured broadcast and cable networks. That doesn’t include viewership on streaming platforms. The 36.1 million tentative total is more than 2014, 2010, 2006 and 2002. 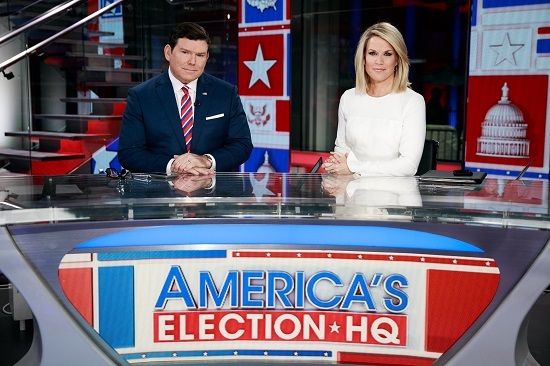 Co-anchored by Bret Baier and Martha MacCallum, Fox News Channel was the most-watched network — on broadcast and on cable — during coverage of the 2018 midterm elections. Not only was No. 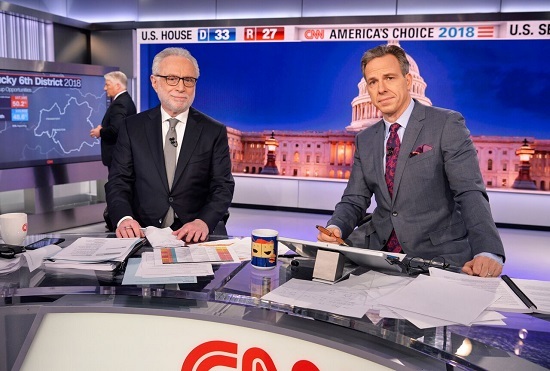 1 in total viewers for 2018, but the network delivered the most-watched midterm coverage in cable news history, according to early data from Nielsen. Fox News was the most-watched network during 2014 Midterms coverage as well. CNN was the No. 1 news network — on broadcast and on cable — during coverage of the 2018 midterm elections among adults 25-54. The network posted its best audience for a midterm broadcast ever, and its largest prime time audience since 2016 election night. NBC was the No. 1 broadcast network during 2018 midterms coverage, defeating ABC and CBS in total viewers and among the aforementioned A25-54 demo. As you may have guessed, NBC and MSNBC together averaged more total viewers in prime time than any other U.S. news organization, averaging 10.4 million viewers, including 3.6 million in the A25-54 demo. The cable newsers were all WAY up in 2018 compared to the 2014 Midterm election broadcasts: Fox News was +23 percent in total viewers and +44 percent in the news demo demo; CNN and MSNBC were both up triple digits percent vs. 2014. Fox News blew its competition out of the water in 2014, aided by Republican party dominance. CNN and MSNBC gave the juggernaut a run for its money this time around, particularly in the demo. 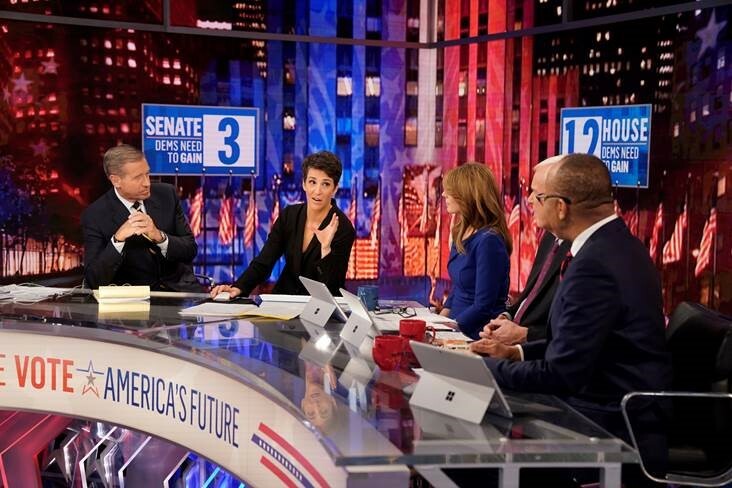 Last night represented MSNBC’s highest-rated midterm election coverage ever during 8 p.m. – 11 p.m. ET in both A25-54 and total viewers. CBS News finished at the bottom of the ratings totem pole this time around. It finished No. 2 in total prime time viewers during the common coverage period (10 p.m. hour) in 2014. 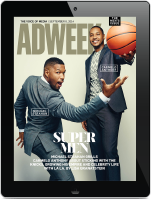 The result was similar for the full coverage, with Fox News finishing as the most-watched network in total viewers, and CNN as the top cable newser in the ad-friendly A25-54 demo. Additionally, FBN averaged 324,000 total viewers and 53,000 A25-54 viewers from 8 p.m. – 1 a.m. ET. 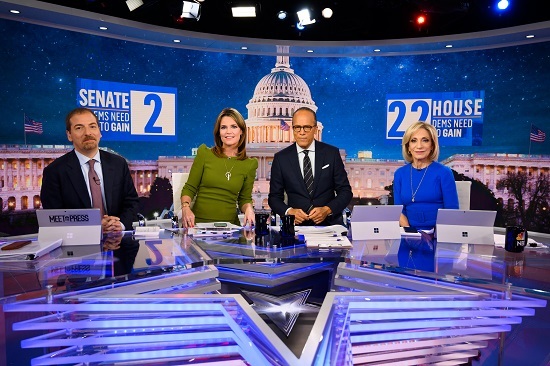 It was FBN’s most-watched midterms in network history.